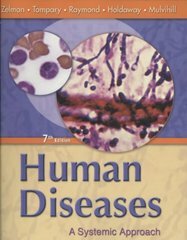 Authors:Mulvihill, Mark Zelman, Mark Zelman Ph.D., Elaine Tompary, Jill Raymond, Paul Holdaway, Paul Holdaway M.A, Mary Lou Mulvihill Ph.D., Paul Holdaway, Mary Lou Mulvihill, Mary Lou E. Mulvihill Ph.D.
Human Diseases 7 Edition This book presents the basic principles of human disease, organized by human organ system. It provides practical information for both health career and non-professional readers—unlike other books, which are generally too high level or specialized for this purpose. New to this edition are: new diagnostic tests and lab procedures; enhanced coverage in treatment and diagnostic sections in disorders to include common treatments and general pharm options; increased coverage of disease statistics, prevalencies, risk factors for diseases and conditions; addition of prevention and aging to Diseases at a Glance table at the end of each chapter; A new page will be added at the end of each chapter which walks the readers through the multimedia resources that are available for each chapter; and much more!